BU Quad Bucket List #4: Beer Me, Boston. With the weeks winding down until graduation, there are many things you should do in Boston before saying goodbye to Beantown. Catch a Red Sox game at Fenway, see a midnight movie at Coolidge Corner, nosh a cannoli at Mike’s in the North End. Now, all that’s well and good, but there’s one thing you need to do in Boston before you graduate: drink. Yes, I said drink. Boston boasts a plethora of bars, pubs and dives to choose from, but for an avid beer lover like myself, one of the coolest things about living in Boston is that you can eschew crowded bars altogether and go straight to the source: breweries. The Bay State is home to a number of craft breweries and brewpubs, from the Harpoon Brewery to Cambridge Brewing Co., so put down that lukewarm Natty Ice and take advantage of all the brewed goodness Boston has to offer. My personal favorite is the Sam Adams Brewery. Grab the Orange Line to the Stony Brook T-stop in Jamaica Plain and spend an afternoon with a free tour of the brewery. You read that right—free, a college kid’s favorite word. The brewery does suggest a voluntary $2 donation, which is given to local charities and will make you a beer-filled Good Samaritan. Win-win. The tour, led by one of the brewery’s entertaining employees, takes you through the complex process of making a simple pint of beer. You get to taste the different types of grains and hops that give Sam Adams its distinct flavor, see some of the action in the malting and brewing machines, and learn strange beer jargon like “wort,” “trub,” and “mouthfeel.” The tour is informative and interesting for beer connoisseurs, but what you really want to know is if you get some free brew, and the answer’s a big malty yes. After the guided tour, you’re led into the brewery’s tasting room to sample some of the finished products. You get three samples, about half a pint each, usually of their signature Boston Lager, a seasonal selection, and the Boston Brick Red, a special brew that’s only available on draft in Boston. The freebies keep coming, as you’re quickly informed that you get to keep your engraved Sam Adams’ commemorative tasting glass, which would make the perfect shot glass if you had Charlie Sheen’s liver. You also get to smell (not taste, as that would probably be lethal) Utopias, Sam Adams’ 25% alcohol experimental beer, which holds the Guinness World Record for strongest beer in the world. Cool beans, er, hops. Post-tasting, you can venture over to the Boston Beer Museum and learn more about brewing history, or you can continue your day of drinking at the nearby Doyle’s Café, a flagship bar owned by Sam Adams’ makers, the Boston Beer Co. The brewery runs a free shuttle to Doyle’s, where you can enjoy some of the newest, freshest Sam Adams brews in town. Free drinks, free glasses, and a free ride to the bar? 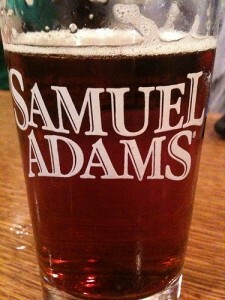 Yeah, you definitely can’t go wrong with an afternoon spent at the Sam Adams Brewery. 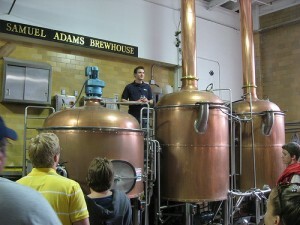 The Sam Adams Brewery is located at 30 Germania St. in Jamaica Plain. 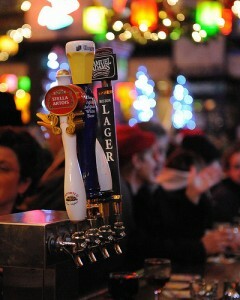 For more information, check out http://www.samueladams.com/. Images courtesy JanetandPhil, Eric P and Ross Housewright on Flickr / Creative Commons.